Four new pieces join the Gingerbread House Collection. 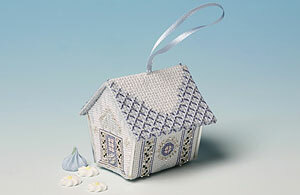 These little houses have pastel coloured roofs and metallic thread and beads are used in the designs to create a sparkle. They are the same size and shape as the original six, with the same materials in the kits, and the decorations worked around their walls are based on popular sweets. As their names suggest, they would make a delicious addition to your Christmas decorations. Sweet icing drips like icicles down the walls of this pale blue and silver house.